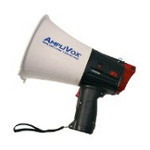 Communicating in large open spaces to large crowds or small is never a problem with an AmpliVox megaphone. 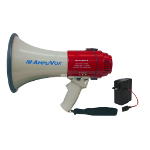 Our lightweight, battery operated megaphones / bullhorns are essential to your public address activities and emergency preparedness kit. Our new waterproof ProMarine model is built especially tough for marine and outdoor environments. 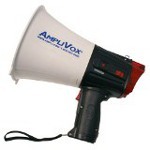 All AmpliVox models have a comfortable pistol grip with three audible modes: talk, whistle, and siren for emergency use. They are powered by alkaline batteries or lithium-ion battery pack with integrated wall charger that plugs into any 110-240V AC outlet. 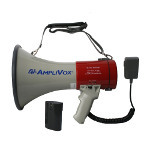 The exclusive battery indicator light feature only be found on AmpliVox megaphones lets your always know the status of your battery life and how much power you have left for maximum safety and security. 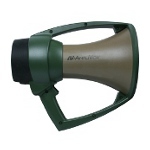 Several models – the S604, S601R, S602R and S602MR – have the new Piezo Dynamic Technology making these lighter and louder than other megaphones. 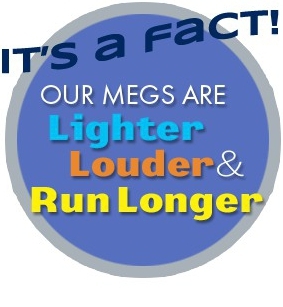 Piezo Dynamic Technology is a revolutionary technique that allows a megaphone to operate more efficiently with less than half the weight of all other brands. 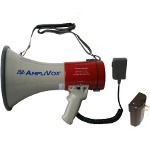 "Commercial Industrial" megaphones with talk, whistle and siren functions made from a durable ABS plastic construction that can take abuse. Effective Range: 50 yards. 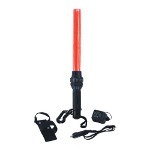 Multifunctional megaphone and LED flashlight wand for crowd control and traffic direction. 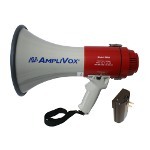 Keep your megaphone clean and dry. 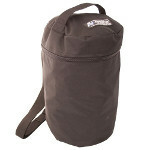 Rugged weather resistant nylon, zipper top, carrying handle with shoulder strap.